Paul Crane is an unwilling agent for the CIA. Little is said about the early life of Paul Crane, probably because it was quite ordinary. He was a bright student, enough to have skipped the 3rd grade. He did very well in college, attending the University of Seattle and obtaining an engineering degree. After college, he got a job with Boeing that lasted for several years until, apparently tired of the coat-and-tie world, he quit that huge corporation and became a free-lance engineer, sometimes working for Boeing. Working for the CIA was never one of his plans but, as the series opens, he isn't given much choice. He is unattached, except for his cat, Tiger. He is young enough to be able to talk somewhat coherently with the young crowd but is old enough to be let into the adult camp. His attitude towards the Agency is not very good, understandable since he was coerced into working with/for them, but his attitudes towards the repressive regime of Communist China is far less. His work, while begrudgingly, is still strong and determined. To modify an old adage, "the enemy of my enemy is an even bigger jerk" seems to be Crane's attitude throughout both books. 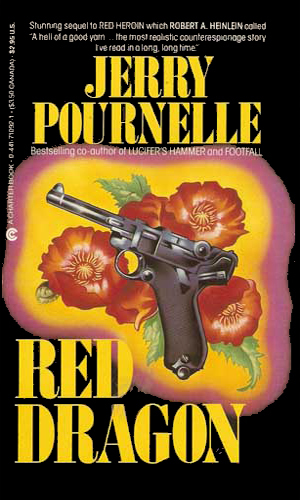 When first published, these books were released under the pseudonym of Wade Curtis and it was only after the author's success with his real name in the science fiction genre that they were re-released as by Mr. Pournelle. Shortly after the second book came out, the first of many terrific science fiction novels came out, especially in 1974 when he teamed with Larry Niven to create several absolutely incredible adventures. Paul Crane is visiting with a friend, newly hired as Chief of Police, when they come across a shoot-out. The Chief is killed, and Paul is forced to kill to stay alive. Then the CIA appears with a blackmail offer – help us or go to prison. Soon he is mixed up with Chinese agents and massive drug smuggling. Needing work, Crane is receptive to the CIA’s offer of employment, though this time it meant treason. the Agency wants Crane to use his financial woes as the reason for selling secrets about laser technology to the Chinese, thus allowing the CIA to follow the chain. Nobody told the FBI, however. After reading the first book, I had mixed feelings about the character. After the second one, however, those feeling settled into the Acceptable category. The first book was hurried. The second more refined. It is truly a shame that were no more. It is interesting that the two first books to be published by this highly acclaimed science-fiction author would have nothing to do with the sci-fi genre but would deal with modern day cloak and dagger. Everyone has to start somewhere and perhaps that was where the money was. Considering his success later, it certainly wasn't where he stayed. I don't rate the two books in this series very high and I doubt the author would, either. 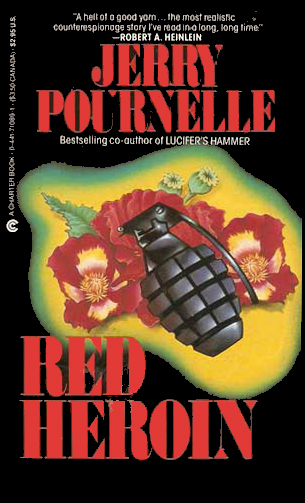 Still, having read a lot of Mr. Pournelle's later works, I can say without hesitation that sci-fi's gain was definitely spy-fi's loss.